You knew him on UBC campus as Dean Gage and later President Gage. He touched many of us as a math professor and later as the person in charge of running a major Canadian university. A number of UBC alumni feel that Walter Gage was a lot more than that. We’ve all heard stories how he would somehow find the supporting funds required for a student to stay on at UBC, obtain a degree, and start a successful career. We recently learned about how he could always find the time to counsel a student and provide much-needed direction. Perhaps that student was you or someone you knew. The Friends of Walter Gage, in recognition of the former UBC Dean and President’s enduring impact on the lives of so many, have honoured his legacy by publishing a book entitled The Age of Walter Gage: How One Canadian Shaped the Lives of Thousands. 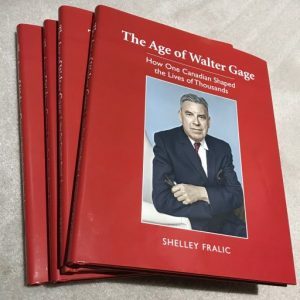 The book, authored by retired Vancouver Sun columnist Shelley Fralic, includes memorable stories, anecdotes, and over 100 images and photographs chronicling Gage’s exemplary life. At the official book launch on February 15, 2018, we announced that the book is available at the UBC Bookstore or online at Amazon.ca. Over the past year we have been collecting memories of Walter Gage for the book. The book is now published but we won’t stop collecting. We will continue to accept submitted stories and post them on this companion website. We deeply appreciate the Applied Science faculty for hosting this website. But it’s not just about engineers. We welcome alumni, emeriti, and staff from all UBC faculties and anyone who knew Walter Gage to share their stories.